Before I even begin this story, I am going to go ahead and say that we were being foolish. No. Worse than foolish. We were being complete f*^%$# idiots. Had this scenario ended any differently, we should have been shoo-ins for the Darwin Awards. This is the tale of how I almost died in Peru. There are two ways to reach Aguas Calientes in Peru, which is the town at the base of Machu Picchu. 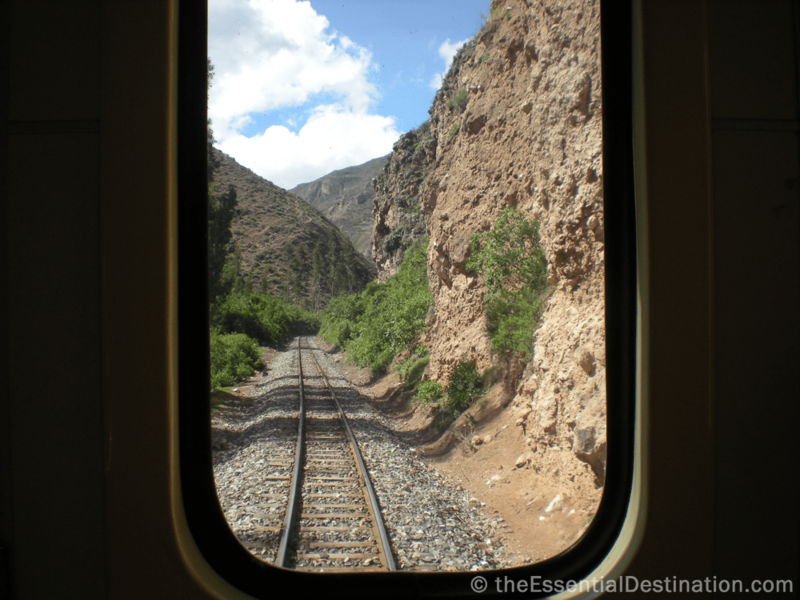 You can either hike the Inca trail which takes you over some breath taking (literally, the altitude can get you) mountains or you can take the train. I found myself on the latter, not because I am lazy. I would have really liked to do it, but I was travelling with a friend who has really bad hips and there was no way that he was going to be able to make it. The view from the back of the train from Cusco to Aguas Calientes. The train dropped us off in this tiny, I mean minuscule town around 10 in the morning. We had organised to head up to Machu Picchu the next morning so we had almost an entire day to kill. We did some perusing at the local markets, visited the hot springs and wandered through every inch of the town. This was all before noon. We had a long afternoon ahead of us. The man who ran our hostel said that there was a small mountain just on the edge of the town that would provide a great view of the legendary lost city of the Incas. He assured us that it was only a 20 minute walk. Our friend said that he could handle that so off we went. A light drizzle had started to fall, but we were not too phased. In retrospect, the gloomy weather should have been a warning. Our directions were to follow the train tracks to the edge of town and shortly after, there is a giant sign clearly marking the trail. What could go wrong? We headed out of town and walked for a few minutes along the tracks when we started to become a little doubtful. We had gone too far. We turned back around and headed back into Aguas Calientes to ask somebody for some more thorough directions. As luck would have it, there was a group of policemen standing around and we approached them to see if they could help. As I was the only one who spoke Spanish, I walked up to them to explain where we were trying to go and all I got was a smile and a pointed finger. I tried to explain again, thinking that he might not have understood, but he just smiled again and pointed back down the track. With nothing better to do, we headed back off along the train tracks. After about 10 minutes, we still had not found any sign or trail heading off into the mountain on our right. We were beginning to think that the people in this town have a slightly different concept of distances and travel times. The rain had stopped and we were enjoying ourselves so we decided to go for a little adventure and see where we ended up. As soon as I saw it, my survival instinct kicked in screaming at me to be sensible. Looming in the distance, we could make out a tunnel that passed right through the mountain. We tried to see if we could go around, but on one side was a giant mountain and to the left was a very steep ravine that plummeted a couple hundred feet. We deliberated, rationalised and ran through scenarios in our head. 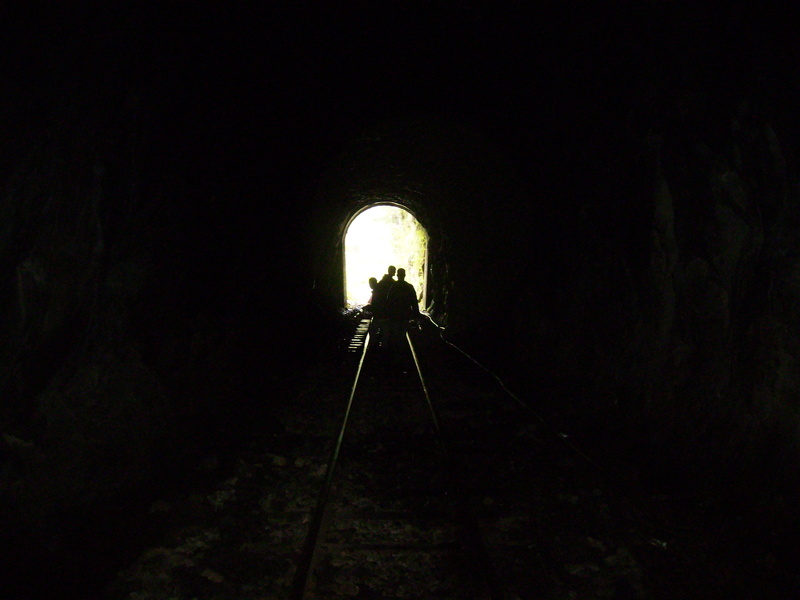 Eventually, it was decided that because the tunnel was not very long, we would go for it. We ran as if a train was going to come around the corner at any minute. We arrived breathless and unscathed on the other side of the tunnel. This is the NOT the tunnel of love. Bolstered by our “brush with death”, we carried on with our little adventure. In the following twenty minutes, two more train tunnels appeared and twice more we ran through. Obviously, the track was only used in the mornings when it would arrive from Cusco and then head back down the mountain shortly after. After a few more minutes, we arrived at a very large clearing that was obviously some sort of train depot. It was completely abandoned save for an ancient woman who was sitting on the ground knitting. As soon as I explained to her where we were trying to go, she burst into laughter. Between fits of hysterical laughtere, she informed us that we were, in fact, idiots. The path was no more than 100 metres outside of town. With the little old lady still laughing at the dumb gringos, we began our slow march back to town. We weren’t too upset as we had definitely filled the afternoon and we would be getting back just in time for a few beers. With all of the excitement over, we strolled through each of the tunnels at a leisurely pace. Our guard was at its lowest and that is when it happened. We were strolling along through the third tunnel without a care in the world. I was in the front and my 3 travelling companions were dawdling 50 metres behind me. It’s funny how life can change so quickly. The following incident probably only lasted for 30 seconds, but it was the longest of my life. I looked up and saw a train boring down on us at full speed. I had time to shout “train” and then I made a break for it. I was only about 10 metres from the entrance of the tunnel and thought that I could make it before the train entered the tunnel. I ran with everything I had in me and made it out seconds before the train entered the tunnel. My friends were still inside and it was a very narrow tunnel with very little room on the sides. The most horrible scenarios and images kept running through my head. I was imagining my dear friends being ripped to shreds by the train wheels. I could almost see it. I could almost hear the conversation that I was going to have with their mother’s explaining how their children met their untimely deaths. I was near hysterical when I heard the faintest sound. It sounded like laughter. The sound kept getting louder and louder and out of the darkness walked my friends completely unscathed. Apparently, there was a rock protruding from the wall that provided a bit of shelter and they all made a dive for it when they saw the train. Their laughter was not inspired by any sort of humour. In fact, soon after they made it out, the laughter began to sound a bit ore like crying. We couldn’t believe that we had made it. It wasn’t until much later that the harsh reality of what could have happened sunk it. We were being complete idiots. Woah, Great story telling! I read this and everything my mother ever told me about playing near train tracks came flooding back. I remember my friend’s dad printing out every story of kids getting killed by trains when he found out we’d put a penny on a track to see if it would flatten.